Final destinations are unknown. In the northwest Atlantic Ocean, the basking shark is found from White Bay and Notre Dame Bay in northern Newfoundland, through the Gulf of St. Lawrence, on the Scotian Shelf and southward to Florida. Satellite tagging has confirmed basking sharks move thousands of kilometres south during the winter, seeking plankton blooms; some of the tagged sharks crossed the equator to reach Brazil. 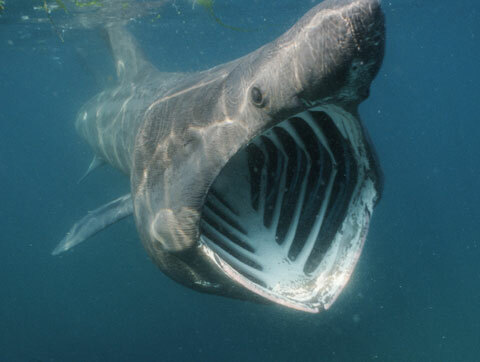 The basking shark will feed in the surface waters along productive coastal zones and continental shelf waters, along both the Pacific and Atlantic oceans. While migrating south for the winter, the sharks remain at great depths of between 200 and 1,000 metres for many weeks. Basking sharks are one of three filter-feeding sharks in the world. They swim with their mouths wide open and filter in zooplankton, small fish and invertebrates. The basking shark is the second biggest fish in the world after the whale shark.